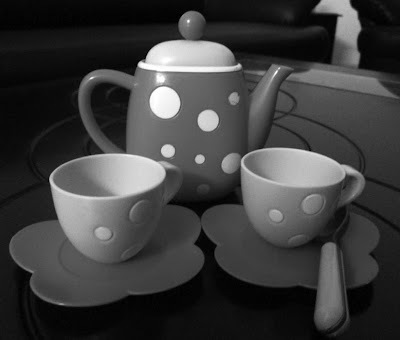 Lil A always makes tea for herself and me in this cute tea set. She even imitates my "Ahhhh" after a hearty sip. As I am settling down slowly, I am coming across all these wonderful blogs and I am thrilled in participating in these various events. The above picture is my contribution for this week Black and White Wednesday, hosted by Satsuki of Stregatto Cuciniero . Black and White Wednesday has wonderful collection of anything culinary related photos. If you want to participate, you can find the details in Cindystar blog.